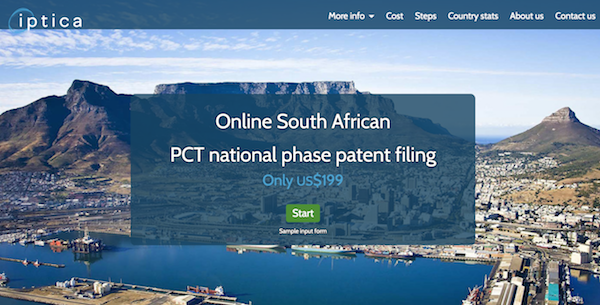 A new online system for filing South African national phase patent applications is now available. monitoring and management of prosecution of your South African national phase patent application to grant via an online dashboard. Since the Iptica system electronically files South African national phase patent applications directly with the South African Patents Office (CIPC), the cost to file a South African national phase patent is now only US$199. See sample SA national phase patent application form. The deadline for filing South African national phase patent applications online is 34 months from the PCT patent priority date ‐ although, South Africa is a "31 month" country, the Iptica filing system submits a request to the South African Patent Office to extend this deadline for a further 3 months without additional charge. Start by adding your reference associated with the SA national phase patent application (optional). This will make future correspondence easier to track. All our communications and invoices will include your reference. Note: All inputs must be entered in English. 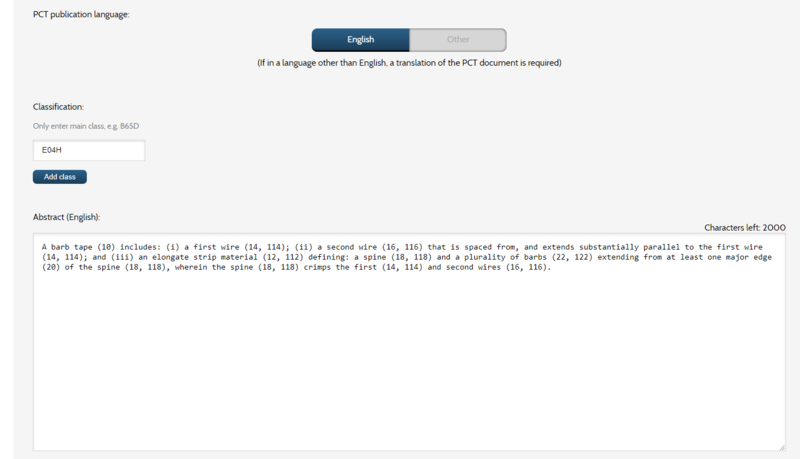 If the PCT patent application was filed in another language: (i) input the English translation; and (ii) upload an English translation of the PCT patent specification (see Step 6). Add the PCT priority details (number, date and country). If the priority document was lodged with WIPO, no copy needs to be submitted to the South African Patent Office – not even an English translation of the foreign language priority document. Similarly, Article 19 and 34 amendments properly lodged with WIPO will automatically extend to the South African national phase patent application. 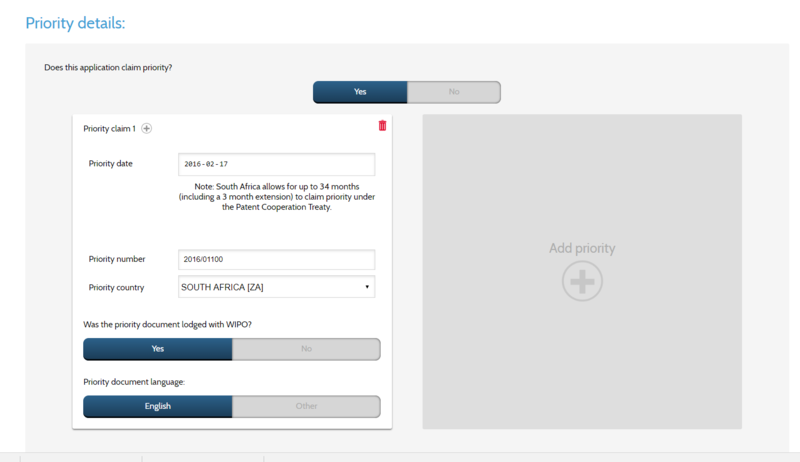 Note: Upon filing, the South African patent application must mirror the PCT application on file at WIPO. In other words, any additional assignment, change of applicant name, correction or amendment of the patent specification can only be effected by a separate (fixed cost) application made after filing to record a change / assignment, correct an error or amend the claims. Insert the applicant's name, physical address and country. No correspondence from the South African Patents Office will be sent to this address. Instead, all correspondence from CIPC will be directed to S&Z Patent Attorneys (as the address for service for this patent application). If the applicant is a company, the name and capacity (e.g. “director”) of the signatory should also be provided. Each national phase patent application may include multiple applicants, and trusts are permitted as applicants. 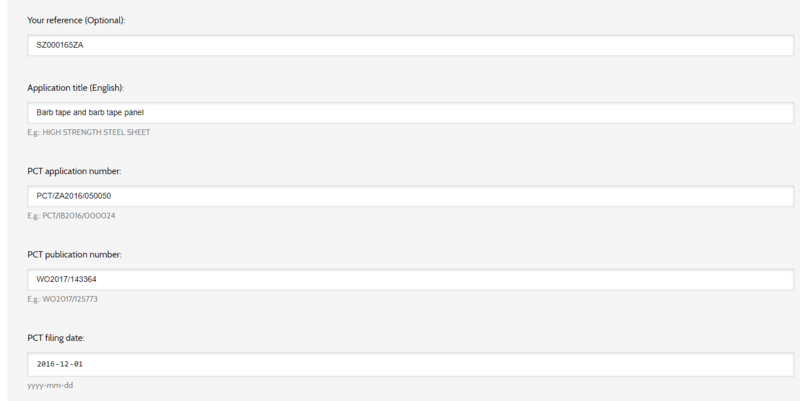 Also, provide the inventor’s name and country. Only the first four letters / numbers of the class(es) cited in the PCT patent application should be used. South Afrca does not classify national phase patents in more specific subclasses. The PCT patent abstract (in English) should also be copied into the abstract field. These forms may be printed, signed, scanned and uploaded to the system. Alternatively, applicants may use the e-signing facility and sign online. No commissioning, legalisation or notarisation of any of the forms is required, neither do we require the original signed forms to be couriered to us. Note: The Iptica system only permits payment, and files the South African national phase patent application after all the required forms (including signed forms) have been uploaded. The document upload system details all documents (including translated / signed documents) required to file the South African national phase patent application. The application will not be filed until all required documents are uploaded. Where the applicant is not the inventor, proof of assignment must be uploaded. Either use the Confirmatory Deed of Assignment downloaded from the Iptica system, or submit other proof (e.g. contract of employment) sufficient to satisfy the South African patent registrar. 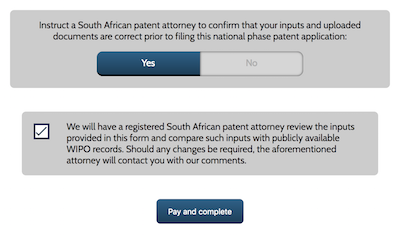 Optionally, request a registered South African patent attorney to review the South African national phase inputs and uploaded documents before filing for only US$49. This will ensure that the application is correctly filed. Finally, accept the T&Cs and make payment of $199 by credit card. Your South African national phase patent application will immediately be filed with the South African Patents Office (CIPC) and the Iptica system will send you a patent application number (together with a copy of the filing receipt) within a business day of filing. Prosecution of your South African national phase patent to grant is easily managed and instructed via the online dashboard, which also details estimated dates for upcoming events. Only South African pharmaceutical patents are examined. All other patents should be accepted within 9‐12 months of filing. Publication must be arranged within 3 months of acceptance ‐ S&Z Patent Attorneys will arrange this at a cost of US$70. The South African patent registration certificate should be received within 6‐8 months of publication, which registration certificate will be scanned and emailed to you. The original patent registration certificate can also be couriered to you for US$110. Should you require additional assistance during prosecution, S&Z Patent Attorneys (as the exclusive Iptica agents in South Africa) will be glad to assist. The total cost to obtain a granted South African national phase (non-pharmaceutical) patent should not exceed US$269!